While active, Troll Warlord swaps from using ranged to melee attacks. Melee attacks have a chance to ensnare, preventing the target from moving or using mobility spells. Berserker's Rage also grants additional movement speed, armor, and increased attack speed. Whirling Axes has different functionality while Berserker's Rage is active.Like his anger, Troll Warlord's supply of axes is infinite. tips: Manta Style's cooldown time will be based on whether Troll Warlord was in his ranged or melee form when the item was used. Troll hurls a fistful of five axes in a cone shape over 900 range, slowing and damaging enemy units.Only axes fueled by hate whirl with such a deadly spin. Troll hurls two axes around him in a close range area of effect, damaging enemy units and causing them to miss some attacks.Keep your enemies close. 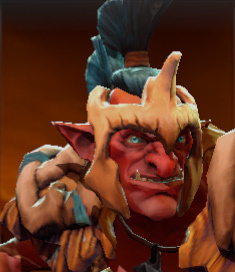 With each continuous blow on the same target, Troll gains increased attack speed. If Troll changes targets, the stacks drop to zero.If at first you don't succeed, strike, strike again. Troll unleashes a powerful battle trance, that forces you to continuously attack the closest enemy unit within 900 range, prioritizing heroes. Damage does not kill you during this mode. Grants you bonus lifesteal, attack speed and movement speed. Applies a Basic Dispel. An adrenaline rush of pure hatred quickens your blades.